Losing the national championship game is tough, as Michigan's players learned Monday night. But even with some key roster decisions up in the air right now, John Beilein has the Wolverines set up for future success. SAN ANTONIO — Confetti fell for one team and tears fell for another, and for a few moments, Jordan Poole couldn’t compose himself. 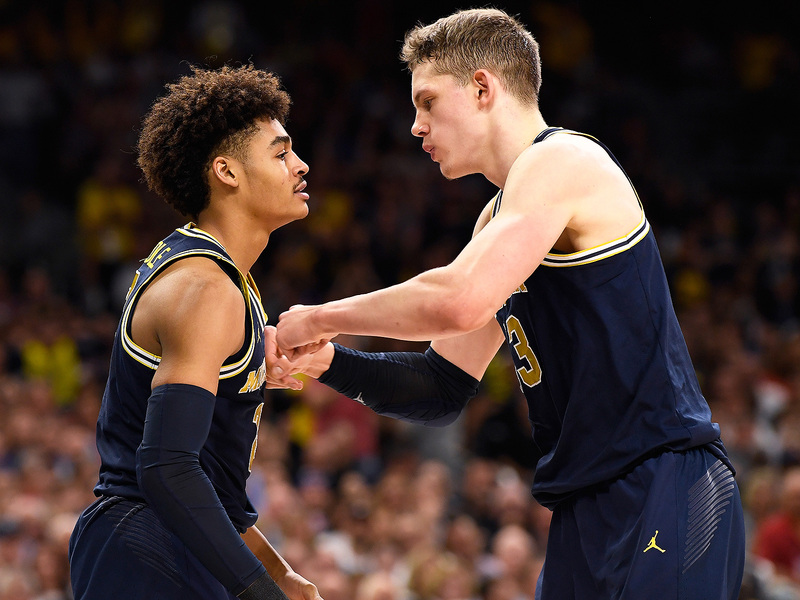 As he sat in the Michigan locker room, Poole did not look like a future All-Big Ten player or the guy who made one of the biggest shots in this NCAA tournament. He was just a 19-year-old in braces, trying to laugh through the tears. Not far away, freshman Isaiah Livers was almost as choked up. As a kid, Livers saw losing players cry and asked his parents: “Why are they so hurt?” And now, Monday night, he got it. He saw seniors Duncan Robinson and Muhammad-Ali Abdur-Rahkman walk off the court, losers in their last college game, to Villanova for the national title, and he couldn’t take it. Poole and Livers, gifted freshmen, embody both the hope and sadness in the room. Their talent is one reason why Michigan will have better teams than this under John Beilein. But that doesn’t mean the Wolverines will get here again. So let’s take a moment, first, and appreciate how close Michigan came to winning the school’s second national title. And yes: The Wolverines were close. It didn’t seem that way Monday night. Well, when you shoot 3 for 23 from the three-point line against the best team in the country, you will lose. The math there is pretty simple, and it goes a long way toward explaining Villanova’s 79–62 victory. It’s not that the Wolverines thought they were the better team. They seemed to know they were not. But they squandered their chance to win by missing open shots, and then by letting those misses affect them in other ways, especially on the glass. For fans around the nation who didn’t watch Michigan all year, understand: The Wolverines played heavyweights Michigan State and Purdue five times this year, and won the rebounding battle all five times. Then they played Villanova, a perimeter-oriented team, and gave up 12 offensive rebounds. This is life in the NCAA tournament. You have to be the best team on six nights. Michigan was the best on five. The Wolverines needed to play really well and hope Villanova had a slightly off night. Neither of those things happened, and so here they were. Beilein stood in a hallway afterward and talked about how “connected” his players were. He is one of the best coaches in college basketball, and the straightest of arrows in a sport that doesn’t have enough straight arrows. In the last two years, Beilein has shown how adaptable he is—this year’s team was better on defense than offense—and he has done a fabulous job hiring assistant coaches. There has never been a more comfortable, more enjoyable time to be a Michigan basketball fan. The Wolverines now enter that Wait And See phase of the college basketball season, when we find out who is staying and who is going. NBA early entries and the transfer market make it tricky to predict next season. Michigan should be very good in 2018–19. The Wolverines’ chance at great may hinge on what happens in the next month. Junior Moritz Wagner declined to answer questions about his NBA future, which was smart. We had to ask. He didn’t have to answer. His decision will be one of the most interesting in the sport. He almost left Michigan last year, but took his feedback from the NBA and returned to school. What does he do now? Wagner is extremely skilled for a 6'11" collegian. But he is not really an NBA athlete. He became a competent Big Ten defender, but he would struggle against the best athletes in the world. Wagner has excellent shooting range but his shots in the paint would get blocked a lot in the NBA. He is probably a second-round pick, and I think he is more likely to go undrafted than in the first round. If he wants to go pro anyway, he should. It’s his life. But it would seem to be a difficult decision. Junior Charles Matthews is an NBA athlete, but his shot is so shaky that it’s hard to see him getting drafted right now. Matthews was the team’s best player over the first five games of this tournament, and maybe its worst in the championship game. He played poorly on both ends. It would not be surprising if Matthews tests the NBA waters, if only to get feedback. But ultimately, staying in school seems like the wise and likely choice. If everybody who is eligible comes back, this is a top 10 team, maybe top five. If Wagner leaves … well, this year’s team started unranked and ended up playing on the first Monday in April. Next year’s team will still be very good. Poole is the probably the best player on the team at creating his own shot. Livers is just starting to realize how good he can be. Point guard Zavier Simpson was a dominant defender this year, and the best player at Michigan’s first practice in San Antonio was freshman point guard Eli Brooks, who is more of a pure playmaker. A top-10 recruiting class is on its way. Beilein will have plenty of very good options. When Michigan lost the 2013 title game to Louisville, players were upset. This felt different. The 2013 team featured several future NBA players. This year’s Wolverines seemed to know this might be their biggest and best shot at basketball euphoria. Abdur-Rahkman​ and Robinson (and maybe Wagner) can leave knowing they did more than just make the national title game. They showed talented young players how to lead a team here. Livers promised to be a different kind of person in practice—no longer the happy freshmen, but a leader. “I want to do what Duncan and Muhammad did, even as a sophomore,” Livers said. Michigan now has a program, top to bottom, that will keep giving itself chances. This year’s run may have been a surprise. A similar run in the next two years should surprise nobody. Before the game—before those Michigan shots went awry and Villanova played at such a high level that it got ugly—I said hello to former Michigan athletic director Bill Martin. I asked Martin: “Has anybody given you credit this week?” He laughed. Eleven years ago today, Martin hired Beilein away from West Virginia. As everybody in the losing locker room here would tell you, it was one of the best moves in the school’s athletic history.